The Louisville Slugger Museum is distinguished from surrounding buildings by the 120-foot-tall baseball bat leaning against it. Erected in July 1996, the bat weighs 34 tons and is made of hollow carbon steel. It's covered with the same kind of paint used on battleships, simulating the wooden bat used by Babe Ruth in the early 1920s -- which was all of 34 inches long. Normally something this size would quickly run afoul of local signage laws, but the bat is also a plumbing vent for the museum's basement bathrooms. So the city said it could stay. Other businesses advertising on Main Street have attempted to cash in on the Slugger's brisk photo-op traffic, with varied degrees of cleverness. A three-dimensional baseball appears to smash a giant window in a sign for Kentucky Mirror and Plate Glass. A few blocks further on, another huge bat -- the leathery flying kind -- hangs upside down and clings to the brick wall of Caufield's, a costume and decoration store. The Louisville Slugger, America's most famous baseball bat, has been manufactured since 1884. In 1974, bat production was moved to a factory in Jeffersonville, Indiana, then returned to Louisville when owner Hillerich & Bradsby Co. opened the factory and museum complex in 1996. The museum, dedicated to the story of baseball and the art of hitting, includes a short film, a replica dugout, interactive displays and baseball memorabilia. The tour allows visitors to see Hillerich & Bradsby bats and golf clubs in production (golf clubs were first made in a Louisville factory in 1916). The museum and factory tour apparently succeed in generating the same must-see status possessed by great ball fields, and Cooperstown, NY's Baseball Hall of Fame. Baseball lovers travel from out-of-state, and even other countries, pilgrimages to understand what manufacturing mojo separates immortal, home run heroes from forgotten foul line bums. We stood next to a 40-ish man who was reverently touching each baseball bat in a display, muttering the model names from memory. 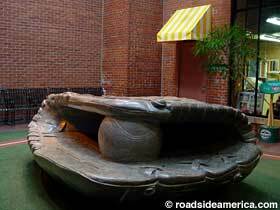 A final mighty tribute to baseball sits in the building's atrium -- a sculpture of a baseball mitt and ball, made from 15-tons of limestone. Louisville Slugger Museum. I-64 exit 4. Right onto River Rd, which runs under the freeway. Left at stop sign onto 8th St., right at the light onto Main St.
Geronimo's Bow and Custer's Pistol, Louisville, KY - < 1 mi. Birthplace of "Happy Birthday to You", Louisville, KY - < 1 mi. 30-Foot-Tall Gold Statue of David, Louisville, KY - < 1 mi. Grave of the Frito-Lay Magician, Louisville, KY - 3 mi.